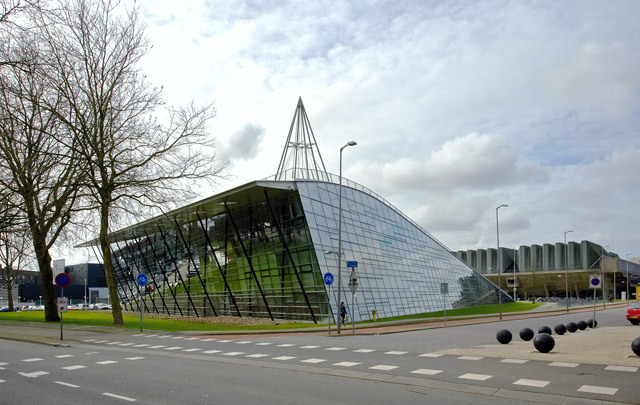 The main library serving Delft University of Technology is sited on a lawn behind Van den Broek & Bakema’s general assembly hall of 1966. This lawn gradually rises to become the roof of the triangular library; this is where the entrance is. An omnipresent cone with an open top pokes through the grass roof. The glass facades leaning forward attentively along the approach roads have an irregular pattern of hatching stressing the horizontal. Though most of the books are stored in a special area in the basement, part of the gargantuan collection is visible in a ‘stack’ reaching up the full height of the main library hall. The hall has a foyer-like feeling of openness with its scattering of furniture including the organically shaped book issue desk. The thrusting cone, which dominates here too, is given over to silent study areas; offices and reading rooms line the library’s glass external walls. Durability and energy efficiency feature prominently in the building, as witness the underground aquifer reservoir for heat and cold storage, the great insulating properties of the grass roof and the use of climate facades for the external glazing.